Cassius was welcomed into the world at Erlanger’s Baroness Hospital on December 10, 2013. He joined a loving family of his dad, Joseph, mom, Vernita, and older sister, Makenzie. Shortly after his birth, the family was alerted to potential abnormalities with Cassius’ hemoglobin. While waiting for the results of additional testing, the family met the hematology team at Children’s Hospital at Erlanger. The team of doctors, nurses, social workers, and child life specialist prepared the family for what could potentially be life with sickle cell disease, a disorder that causes red blood cells to become misshapen and break down. Cassius led the life of a normal baby until he turned six months old. Then, in June of 2014, he experienced his first serious infection and had to be hospitalized for MRSA. The next month the family was faced with another hospitalization as Cassius endured his first sickle cell pain crisis, which happens when damaged red blood cells clump together blocking blood flow. For dad, mom and big sister, it was difficult to watch Cassius cry in agonizing pain as doctors and nurses worked to control the pain and prevent dehydration. 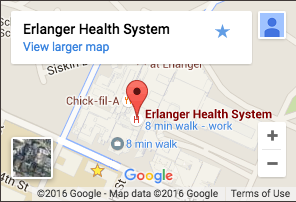 It was during these first two visits that the family established a strong bond with those working in the Children’s Emergency Department and the inpatient floors of Children’s Hospital at Erlanger. Over the next several months Cassius battled multiple hospitalizations, emergency room visits, sickle cell pain, infections, pneumonia, flu and a respiratory virus. He also required numerous blood transfusions to raise his hemoglobin levels and help his body recover. In July 2015, Cassius faced one of his most difficult battles to date when he was diagnosed and treated for acute chest syndrome, a lung complication that can be life threatening. With so many hospital stays under his belt, Cassius’ family and hematologists felt he would benefit from the placement of a “port-a-cath,” a small port that let his care team draw blood and give medications without frequent needle sticks. He underwent surgery for this in September with no complications. On his best days, with minimum pain, Cassius is a bubbly, excited, curious, growing, and entertaining boy who is preparing to be a big brother in December. Although he has faced a few developmental delays, he continues to make amazing strides with his learning and speech development.